BASICALLY…: When a town is being harassed by a corrupt industrialist (Sarsgaard), bounty hunter Sam Chisolm (Washington) assembles six outlaws (Pratt, Hawke, D’Onofrio, Lee, Garcia-Rulfo, Sensmeier) to help him save the day.. The Western genre has definitely withered in the past few years, compared to its heyday back in the 50s and 60s. Back then, we were given classics like The Searchers, The Wild Bunch, and the Dollars trilogy, but nowadays successes are far few in between; aside from exceptions like the Coen Brothers’ True Grit remake and Django Unchained, many Westerns made nowadays like The Lone Ranger and Cowboys and Aliens have all been critical and financial duds. 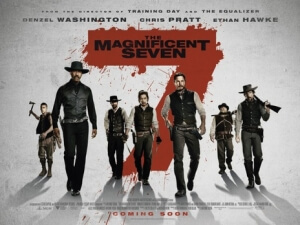 In response to its endangered existence, director Antoine Fuqua has decided to bring the Western back to its roots, by remaking one of the old classics The Magnificent Seven. Itself a remake of Akira Kurosawa’s Seven Samurai, that film was a star-studded rootin’-tootin’ shoot-‘em-up blast, and this new version gives off very much the same vibe, albeit with a slightly sharper edge to it. Fuqua’s titular septet includes Sam Chisolm (Denzel Washington), a bounty hunter; Josh Farraday (Chris Pratt), a gambler; Goodnight Robicheaux (Ethan Hawke), a sharpshooter; Jack Horne (Vincent D’Onofrio), a tracker; Billy Rocks (Byung-hun Lee), an assassin; Vasquez (Manuel Garcia-Rulfo), a Mexican outlaw; and Red Harvest (Martin Sensmeier), a Comanche warrior. They are brought together when a young woman named Emma Cullen (Haley Bennett), representing the town of Rose Creek, recruits Chisolm to fight off the threat from corrupt industrialist Bartholomew Bogue (Peter Sarsgaard), who rules the town with an iron fist. Not for long, if these seven men are as tough and courageous as they’re thought to be. At its core, The Magnificent Seven is a throwback movie, to a time when a Western film could be fun and entertaining instead of long and needlessly complicated like some of the ones today. Fuqua has gone on record to detail his love for the genre while growing up, and his passion really shows with the old-school approach he has decided to give this film, from the grand and epic score – partly done by the late James Horner, who began working on the music before his untimely passing last year – to the simple outline of the story, which is the basic but accessible “outlaws must defend town from bad guy” plot that most Westerns seem to do the best. Watching this film is like being brought back to a time when it was actually cool to watch a Western on the big screen, and it just shows how much the genre has seriously floundered as of late when a remake of a classic needs to come into play to show everyone how it can be done. Fuqua must have had an absolute blast on the set, as did probably its cast, who while not given the most fleshed out characters in the world still have tons of fun playing these larger-than-life figures, which makes their performances all the more engaging and likable. Pratt, having now grown comfortably into his leading man status following Guardians of the Galaxy and Jurassic World, turns up the charisma to 11, and in many ways is the most jovial and fun to watch out of the seven, at least for me. Others like an ever-reliable Hawke, and D’Onofrio who has decided to give his character an oddly high-pitched voice for no real reason, are fine in their own right, while Washington – who I like as an actor overall – gets probably the least interesting arc out of the (wild) bunch. Sarsgaard also makes the most of his limited screen time – I reckon he’s in the whole film for just under twenty minutes, including his presence during the climax – as a real slime-ball of a villain who doesn’t even attempt to hide his nastiness, particularly in an opening sequence where he gets to shine in all his unpleasantness. I also rather enjoyed Bennett who, as the sole female of the main cast, gets some enjoyable and satisfying scenes to work from, and more than holds her own against the dominantly male ensemble. It’s not a perfect film, however; as I have come to find with a lot of Fuqua’s films, the running time is a tad excessive and indulgent, and there are definitely parts of the film that could have easily been cut without having any impact on the rest of the film. At 133 minutes, it certainly outstays its welcome just a little bit, with several sequences probably needing a little chopping down in the editing department, particularly the climax which, while certainly entertaining and action-packed, had me just checking my watch once or twice. I noticed it previously with Fuqua’s The Equalizer and its many endings, and also with Southpaw which had scenes that tended to go on for far longer than they needed to. It’s a minor gripe, and that’s just more down to how I feel about the director’s style more than anything, but the bloated length of this film can make it seem slightly overlong, which for a simple story such as this isn’t always a good thing. Most of all, I appreciate that with this film, there are still some filmmakers out there who are eager to make more Westerns, and not let it die out like the rest of Hollywood is seemingly doing. While it’s far from perfect, Antoine Fuqua’s The Magnificent Seven is one of the few big-budget films of its type nowadays that actually delivers the fun and entertainment values that most other modern Westerns fail to do. I certainly hope that this movie does well enough to inspire a future filmmaker to make the next great Western to go alongside the classic ones of the 50s and 60s, and if this is any indication, there might just be some life in her yet. The Magnificent Seven is a fun and enjoyable remake which, while not perfect (something that its overlong running time attests to), shows that enthusiasm for making a Western in this modern age is alive and well, with director Antoine Fuqua and its starry ensemble cast clearly having a blast making this film, and delivering a film that’s solid one-off entertainment.